Eco-lodges in the Ecuadorian rainforest offer excellent bird watching and wildlife spotting opportunities, guided tours, eco-adventures and surprising luxury. From exclusive boutiques to functional huts deep in the jungle, this article breaks down the best lodges in the Ecuadorian Amazon. Within a few hours drive from Quito, you can be surrounded by thick rainforest, replete with the chatter of some of the planet’s most diverse wildlife. The ultimate overnight stay here is at a wilderness lodge where the jungle closes in around you, offering superb bird and wildlife watching opportunities. Roads only penetrate a portion of the Amazon and some lodges are only accessible by river or by air. Lodges that can be accessed by road are usually less expensive and likely to be more flexible with shorter stays (1-2 nights). Lodges only accessible by river or air – where logistics are more challenging – often require a minimum stay of three nights. Therefore, places that have a touch of luxury may be even cheaper than more simple lodges, due to their location. Note that this article includes three price categories: budget, mid-range, and high-end. Activities usually include wildlife observation, forest walks, river trips and ascents into the canopy. Certainly, you will experience a great deal of absolute wilderness. Electricity may not always be available at your lodge and internet access is likely to be slow or not available at all. Pathways around the lodges are not always well-lit – bring a flashlight for night walks. Mosquitoes may be present, especially at lodges located at lower elevations, so have long sleeves and pants with breathable fabric. Other packing list items can include: binoculars, waterproof bags, mosquito repellent, ventilated footwear and rain gear. 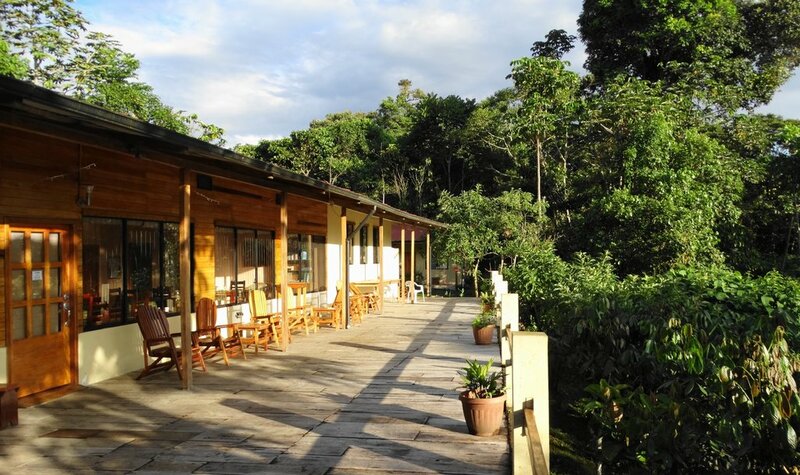 Cabañas San Isidro offers surprising luxury in a beautiful cloud forest. Cabañas San Isidro is situated in peaceful cloud forest, around 2000 m above sea level and just three hours drive from Quito. It's a popular place for birdwatchers, who come here to study the many species found in the extensive grounds, bisected by good trails. The lodge offers neat private rooms, many with their own private porches and hummingbird stations. Rooms are comfortably furnished and have private bathrooms and hot showers. Common areas have floor to ceiling windows, allowing you to observe the forest from the comfort of your room. In addition to the excellent bird watching opportunities, you'll likely spot a number of mammals, including giant anteater and mountain tapir. The lodge also has a restaurant with a great reputation, a bar, and a games room. It also offers special activities for kids, including fishing, painting and cooking classes. Hamadryade Lodge offers a slice of luxury in the rainforest. This French-owned boutique option near Misahuallí, one hour from Tena, has a handful of upscale cabins, with suave contemporary designs inspired by the area’s indigenous communities. Pebble pathways surrounded by fresh gardens connect the cabins. Some of the bungalows are suite-size, good for families or couples looking for extra space. Activities include jungle treks and rafting. After a long day of in the rainforest, you can relax in the pool or partake in several types of wellness treatment. Another nice feature is the lack of mosquitoes. At mealtimes, the restaurant serves French cuisine and wine. You come for the style more than for the jungle, but the hillside setting is serene. The Parque Nacional Sumaco-Galeras is a huge tract of high jungle cloud forest, and Wildsumaco Lodge stands on its southern edge. This is a no-frills place with a pretty hilltop location, simple rooms, and comfortable common areas. The main activity of this lodge is the bird-watching and the opportunities around the lodge for spotting birds is excellent. The reason for its incredible avian diversity is the terrain: low jungle, high jungle, and páramo (mountainous uplands) are all close at hand. 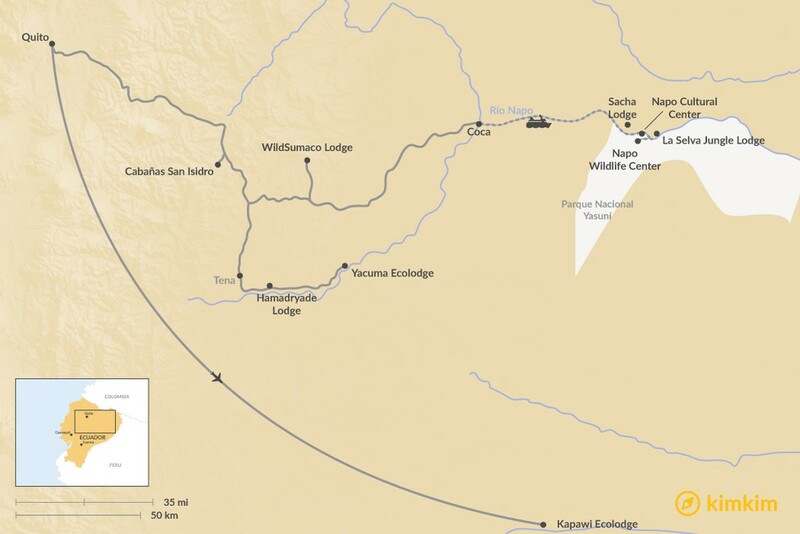 And on a challenging but rewarding 3-5 day return hike from here, you have the unique opportunity to pass through all three topographical zones on foot, staying at refuges along the way. 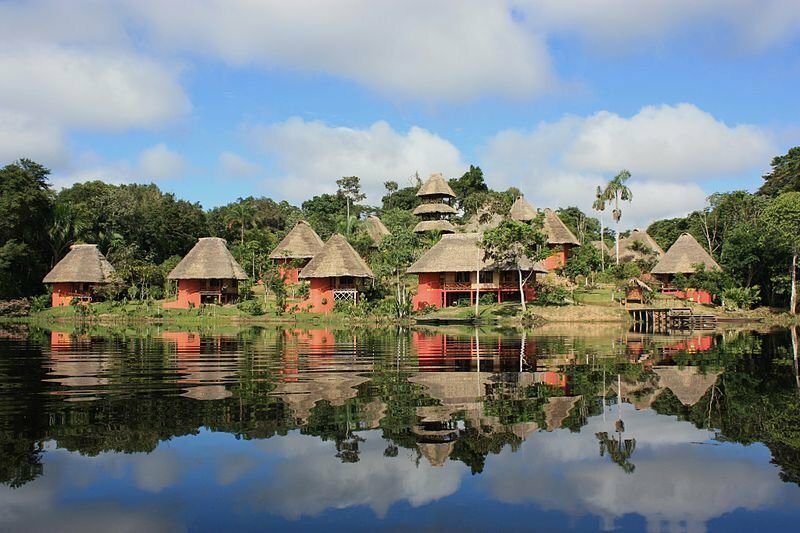 This Swiss-owned lodge has remained one of Ecuador’s very best jungle lodges since its opening in 1992, set on the Laguna El Pilche Lake on Ecuador’s largest private reserve of protected forest. There are over 20 well-equipped cabins connected by boardwalks to a central two-story lodge with a restaurant and upper-floor bar. 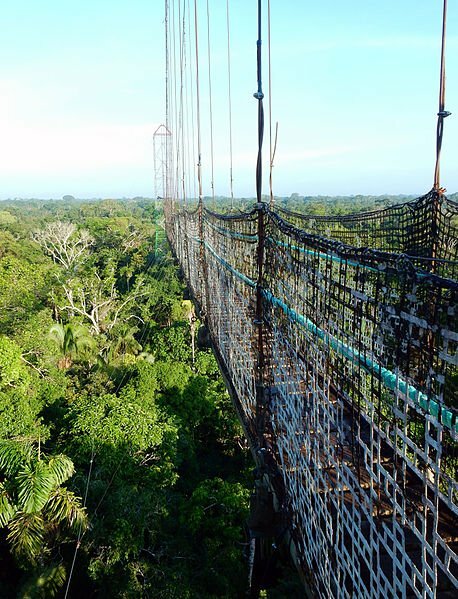 An attractive feature is the lodge’s 60 m canopy walkway and a 45 m high observation deck in the upper branches of a ceiba tree. The lodge also features a unique "pool" which is actually a piece of the lake protected by mesh wire. You can spend your days here paddling creeks in a canoe, spot caiman on a night tour and visit a clay lick in the jungle where parrots congregate. 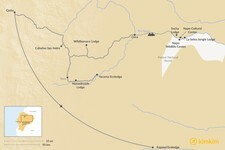 Approach: 2-hour river trip from Coca, short walk then 15-minute canoe ride. 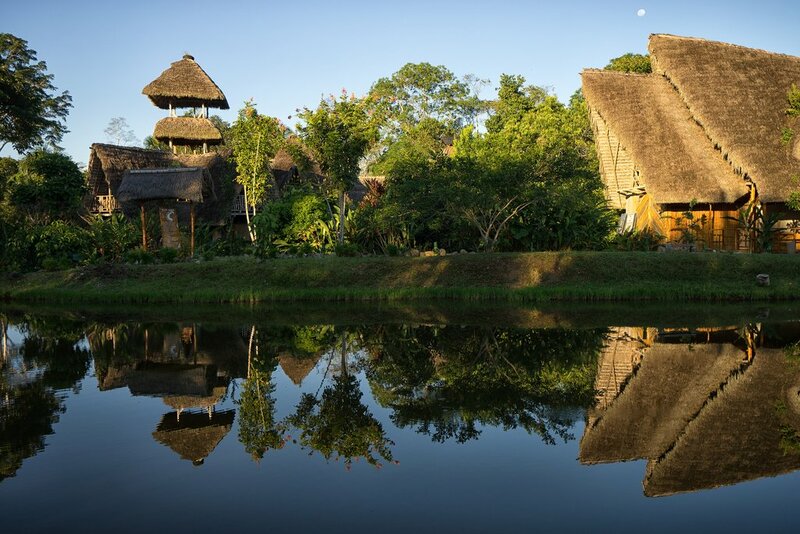 Thatched cabins at the Napo Wildlife Center (credit: Napo Wildlife Center). The well-run Napo Wildlife Center boasts an enviable location in the heart of Parque Nacional Yasuní, mainland Ecuador’s biggest and most biodiverse protected area. Consequently, it is very popular with tourists. The first thing setting this lodge apart is the arrival: not by motorized canoe as at other jungle accommodation but by an atmospheric paddle up a blackwater tributary away from the main river, the Río Napo, usually making for memorable wildlife sightings. 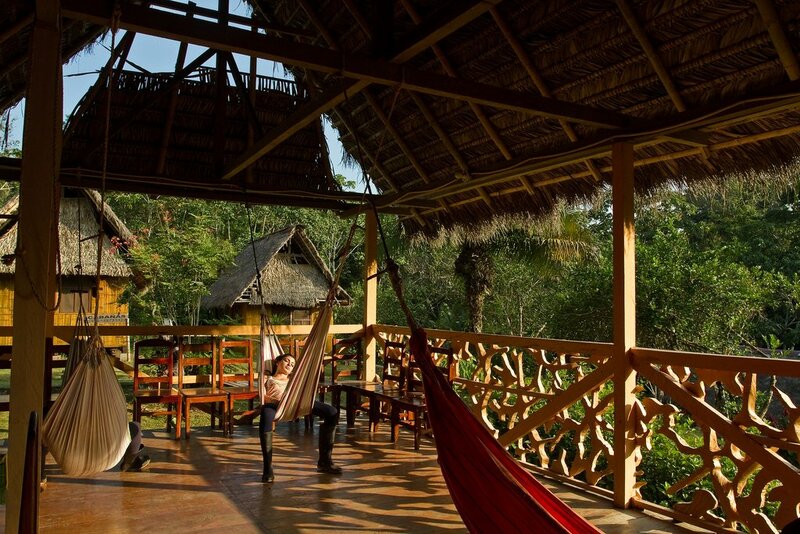 The lodge itself, hugging the Laguna Añangucocha lake, is luxuriously appointed, with 16 thatched cabins scattered around a pyramid-like main hall with a bar, library, 24-hour electricity and observation tower. The local Kichwa community, who comprise most of the lodge’s employees, own this entire eco-project. 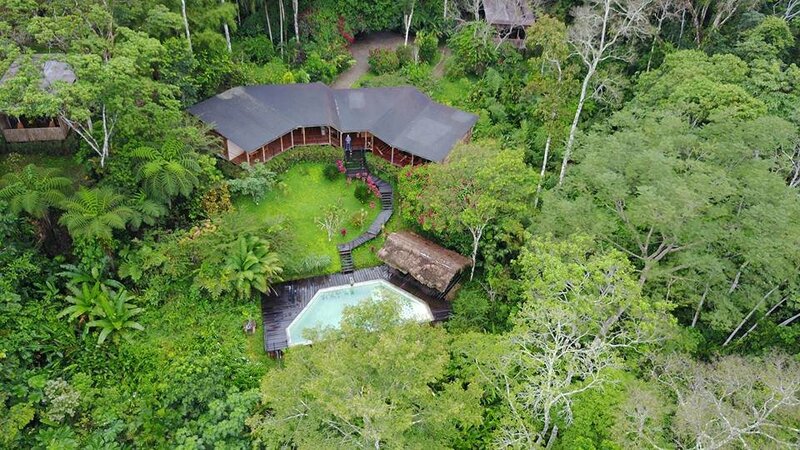 This lodge, also known as the Yasuní Ecolodge, is the only one that can claim to be in Parque Nacional Yasuní besides the Napo Wildlife Center, and it is a much cheaper alternative. The cabins are well-furnished and spacious, with private bathrooms and wide balconies conducive to relaxation. The lodge sits within the Kichwa community village on the Río Napo and a stay here affords the opportunity to meet members of the community. 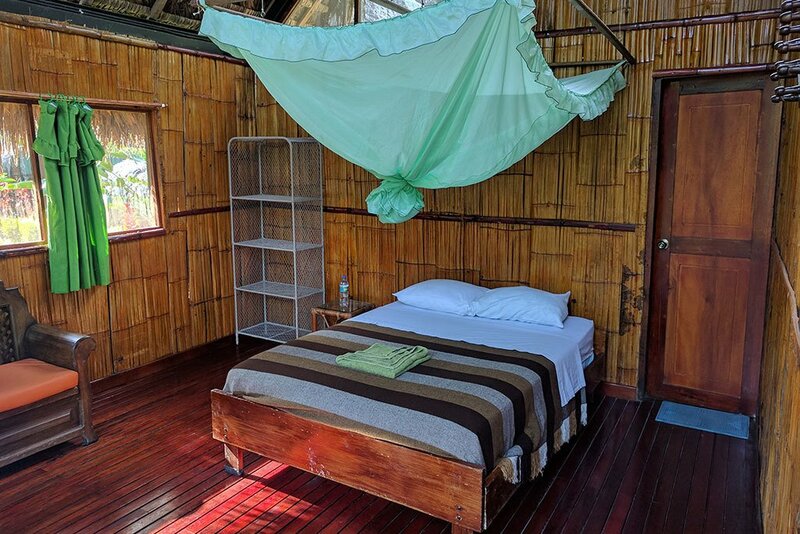 Another top-end option on the lower course of the Río Napo, and rivaling even Napo Wildlife Center for the price is La Selva Jungle Lodge, also the oldest lodge the in the region. The lodge has seen recent renovations and offers sumptuous suites, some of which have hot tubs. The spa service, with massages and baths, adds to the luxury of the place. For wildlife spotting, you can ascend a 43 m-high observation platform. The naturalist guides are highly regarded and lead excursions into Parque Nacional Yasuní, located just across the river. Huts at the remote Kapawi Lodge. Kapawi Ecolodge is set deep in the Amazon – the nearest road is a ten-day walk away. Even river access is not practical because of the time involved, so access is by small plane. The isolation and the pristineness of the jungle around, emphasized as you fly over it on the approach, makes this lodge special. Kapawi, a leader in sustainable tourism, offers family-friendly activities. You can spot wildlife from kayaks, try to use a blowgun, and go on nature walks with Achuar guides. The thatched cabins are surprisingly comfortable for such an out-of-the-way location. As a remotely located lodge, you'll be away from modern technology, internet and the like, which is part of the attraction of the place for people who really want to switch off and connect with nature. Yacuma Lodge cabins, this lodge is a joint initiative with the Kichwa Indigenous Community. The Yacuma Ecolodge was established as a joint initiative with the Kichwa Indige­nous com­mu­nity and a stay here will give you great insight into the traditions and lifestyle of the Kichwa people living in this area. Visiting is a great way to support the local community. 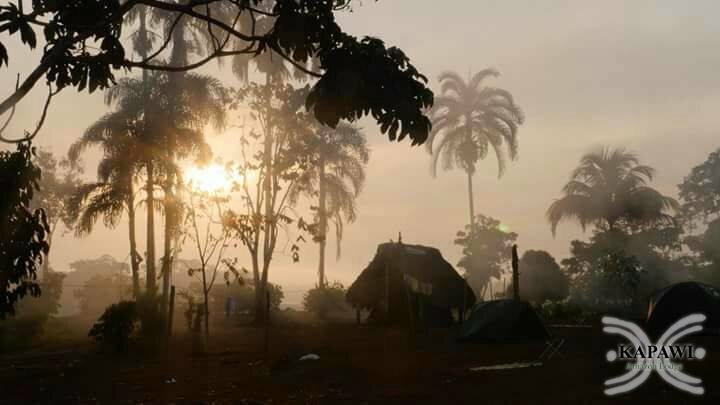 Activities include jungle walks with a Kichwa guide to waterfalls and caves and visits to village farms. Birdlife around the lodge is exceptional. A parrot clay lick, just a 30 minute walk away from the lodge, attracts hundreds of parakeets and macaws each day. Accommodation at the lodge is in huts built according to traditional Kichwa design, with simple but comfortable furnishings. Meals are delicious, diverse and filling, and always served with lots of fruit. 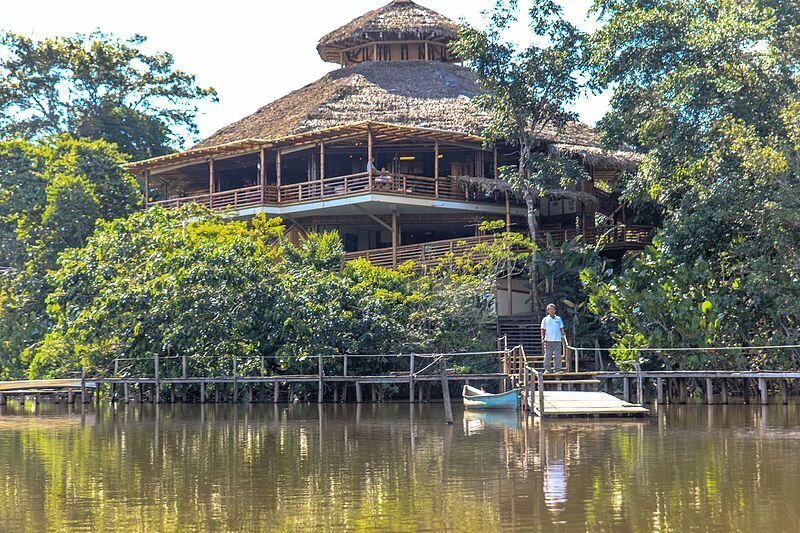 The lodge is located on the Chontayacu River, close to Yasuni National Park, where you can make a full-day excursion. Approach: 1.5-hour drive from the city of Tena.